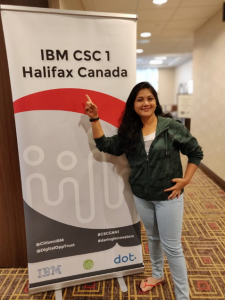 I recently completed my IBM Corporate Service Corps (CSC) assignment in Halifax, Canada, and I would like to pen down my experience on why this has been one of the most impactful work experiences I ever had. It was a decade ago in 2008 when IBM decided to come out with a unique program which will leverage IBM’s problem-solving culture to empower community organizations to address complex issues, develop the leadership and functional skills of IBMers and at the same time deepen IBMers’ connection to IBM. 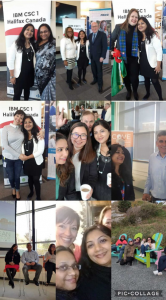 While the IBM CSC program has been very successful in developing countries and has delivered benefits in solving critical on-the-ground issues of these communities, 2018 was the first year that IBM started looking into unique challenges faced by the communities in the developed countries like the USA, Canada & Australia. Having been assigned to Canada myself, I understood firsthand how developed countries also have improvement opportunities and how the IBM CSC program can still bring a positive impact to the communities by partnering with the nonprofit organizations in these regions. In October 2018, 15 highly passionate, multitalented IBMers who are experts in various areas like Agile, Analytics, Cognitive, Design thinking, Project Management, Consulting, Social, Mobile etc. came together in Halifax for a month and worked closely with four very prestigious organizations to address some key challenges they are facing. Four weeks were loaded with an avalanche of information uncovering layer by layer – including seeing trees turn colors from green to y phenomenon happening all around me, with the landscape getting painted with different hues which I have only seen in movies. Every corner in Halifax was so picturesque that I felt like stopping to take the pictures every five steps of walking. Little did I know that it was just the beginning of even more exciting things to come. 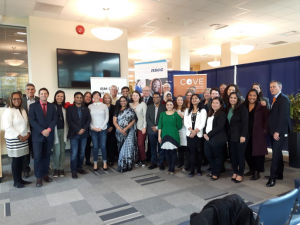 Our team was welcomed by the Premier of Nova Scotia, the Mayor of Halifax, along with four of our clients — Centre for Ocean Ventures & Entrepreneurship, Nova Scotia Community College, Department of Education, and Immigrant Services Association of Nova Scotia. Each client talked about the expectations from our projects and the impact they would like to have on the Nova Scotia community. Our sub-team was assigned to work with the Centre for Ocean Ventures & Entrepreneurship (COVE), where our learning started with a field trip to the two beautiful fishermen villages of Lunenburg and Mahone Bay, followed by the Nova Scotia Sea School. Our client Dr. Sherry Scully, the Director of Learning & Development Department for COVE Oceans and a brilliant storyteller, generated our interest in knowing more about the school and how to help children acquire hands-on adventure experiences that are inspired by the ocean. Second day started with a Design Thinking workshop where we processed our thoughts and observations about the previous day’s field trip. We saw our ideas mingling with the client’s ideas and things started to take shape slowly. We asked the important questions: What is Halifax missing — the consumers of all of these facilities and learning? How can we get more youth know about this? How will more people become aware of the avalanche of opportunities existing in Ocean industry, that it is not just fishing or shipbuilding but much more than that? The next four weeks saw us working really hard to understand the on-the-ground challenges of the ocean industry here in Halifax, hoping to help COVE enable the youth of Nova Scotia and making them aware about the wide variety of new careers opening in oceans. 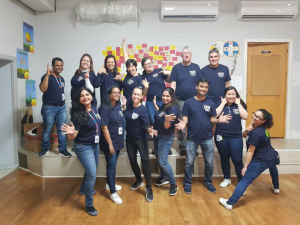 On our month-long assignment, we also had the opportunity to participate in a Community Day where we helped a local NGO – “Hopeblooms” – to adopt Design Thinking for solving their day to day issues. It was one of the days well used for humanity. On the last morning in my hotelwith a stunning view from my window, I was sipping coffee with mixed feelings – of happiness to reunite with my family soon and my heart sinking to realize that I may not meet my CSC friends again anytime soon! That was one of the fastest months I lived in my life. The thoughts were flowing like a dream running in my mind and it gave me confidence that this one month of our pro bono consulting will open new doors for COVE and IBM to be able to bring a much-needed paradigm shift in the Nova Scotia community, and Canada as a whole. In that one month, our host organizations gave us the best hospitality experience that made our stay memorable and unforgettable. We certainly lived this wonderful dream with honor, excitement and surprises every day! Sayonara Canada! Until we meet again. Interested in joining a company that empowers you? Search for job opportunities at IBM or join the IBM Talent Network to get updates.